You hear a lot of talk about learning to “be present”. My man Anderson Cooper recently dedicated a 60 Minutes (our favorite podcast) segment to the concept. There are workshops and retreats all over the world targeted at busy folks who want to learn the art of living in the moment. Apparently, just being is harder than most of us realize. Think about it. You’re at work – Preparing for an important meeting. Debriefing on your last project. You’re with friends – Sharing the story of your last Tinder date. Planning a weekend getaway. At just about any moment throughout the day, we are focused on either the past or the future. Aside from those mindful folks who practice some form of daily meditation (me, not included), there are few of us who devote any time each day to being present. Too much to do and plan and think about. I am the WORST when it comes to this. A real "multi-tasker", I'm rarely able to focus on one thing at a time. I remember once taking part in a “Sound Bath” in Joshua Tree, which promised me aligned chakras, waves of peace and total relaxation. As I lay in the large wooden dome, odd crystal sounds washing over me, grocery lists and song lyrics and decorating ideas danced uncontrollably in my head. More often than not, my brain is anywhere but here. And then I realized the other day, deep in conversation with fellow travelers about the aforementioned podcast and the importance of "now" and whatnot, that maybe that’s one of the subconscious draws of long-term travel. When we disconnect – from our jobs and our bills and even our friends – every moment has no choice but to consume us. The majority of our days spent completely present, absorbed in whatever it is we are doing, seeing, the conversation we are having. There is nothing but us and this place, right now. Sure we tell stories of things we’ve done and plan where we’re going next and miss so many people back home – lots of distractions pull us from the moment. But generally, far more of our day is spent here and now than it would ever be back home. Touching, tasting, trying, feeling, experiencing. Maybe that’s why traveling makes us feel so alive. 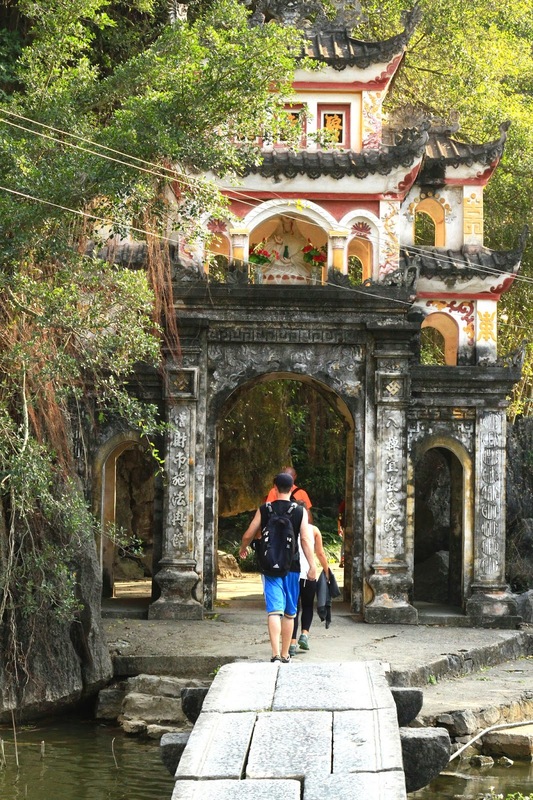 While on a bike ride through the rice fields of Ninh Binh, we approached an ancient pagoda, its entrance a large arch flanked by two smaller ones. Our guide told us that the three openings represented the past, present and future, then challenged us to guess which is the most important (and thus, in the middle). Everyone in our group guessed simultaneously – “The future?” But I knew immediately that the most important thing, the central arch under which we should enter, is the present. Your post was suggested to me by mutual friend, Dirk V. I think you nailed it. I know that I'm often not present. It's a very human problem. I've found that daily meditation has helped me greatly by a) grounding me more in the present by giving me skills to focus on it, and b) by allowing me to gently pull myself back to the now when I drift off _without_ judgement when I do. I live far more in the present than I ever used to as a result. Thank you for sharing your experience and your travels! That's very cool. Thanks so much for reading and commenting, Roger. Really appreciate the feedback, and love when something I write actually speaks to someone :-) Hoping to learn to meditate myself on this trip. I could certainly use it!